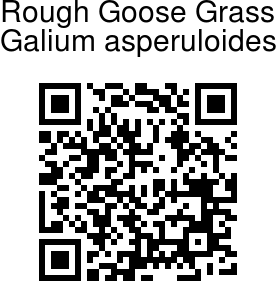 Rough Goose Grass is an erect or prostrate annual herb, with stems smooth and quadrangular. Leaves are stalkless, stalked, 6-8 in a whorl, 2-5 x 0.4-1 cm, narrowly elliptic, lanceshaped or obovate, spoon-shaped or broadly elliptic, pointed or long-pointed, midrib distinct, hairless, margins rough. Flowers are borne in few flowered cymes at branch ends, or sometimes in leaf axils. Peduncles and flower-stalks are mostly slender, hairless. Dlowers are minute, white, bracts linear. Fruit is about 2 mm long, spherical, covered with long hooked bristles, stalks enlarged up to 5 mm in fruit. 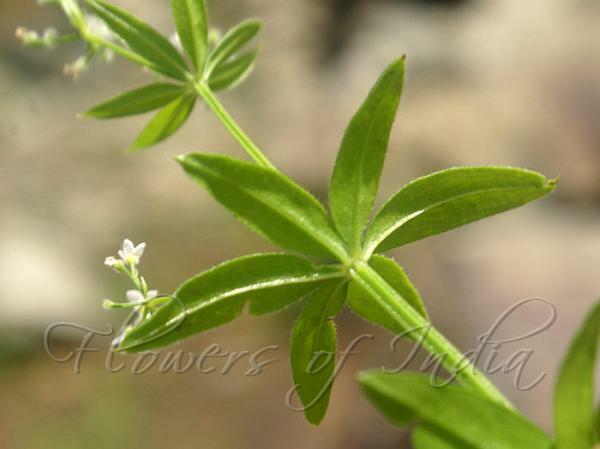 Rough Goose Grass is found in forests on mountain slopes, thickets, ditch sides, along rivers, meadows, in the Himalayas, in Afghanistan, Kashmir, Pakistan and parts of China, at altitudes of 1500-2800 m. Flowering: April-August.